Predict Player Streaks as you compete in MLB's Beat the Streak to win $5.6 Million Dollars. Make more money in Fantasy Baseball by predicting which players on your roster will do well today. Your point totals will increase substantially as you pull players from today's roster whose index is in the MINUS category and replace those players with players in the PLUS category. First, the team VMI's on the Team VMI's page will show data for tomorrow and the current day. Non-member displays of that page begin with yesterday's data. 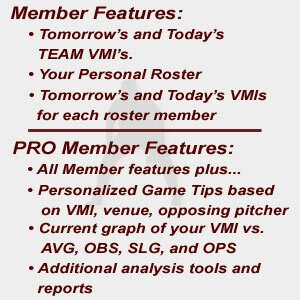 Second, you will have the ability to define your personalized 30 man roster from which you will see today's VMI's for each player on your roster. This feature is accessible using the Manage Roster menu item above. Having a personalized roster will allow you to decide which player is projected to have a better day and who you should play. When and if players are traded, the up-to-date VMI's for their revised travel locations will remain accurate. And, you can make changes to this roster at any time. Third, on the Roster VMI's you can see all the players on your roster at a glance along with the VMI for the current day. Your membership price is $19.95 per year. Enjoy the benefit of knowing ahead of time which pitcher will have his best stuff and which hitters are still adjusting to additional ball movement.